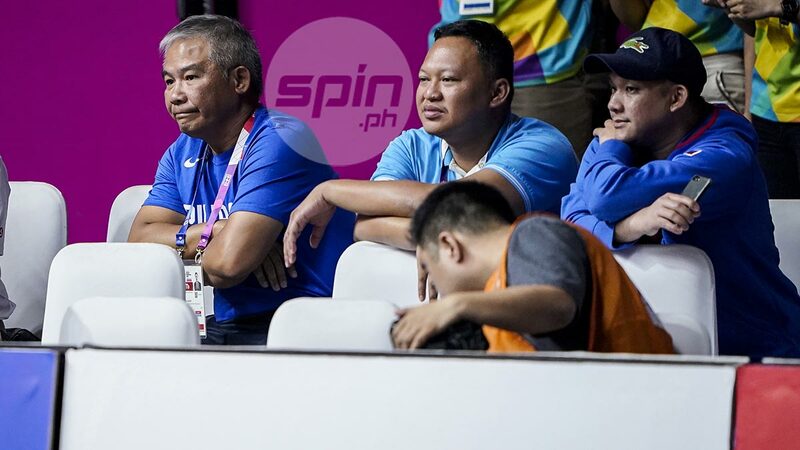 Gilas coach Chot Reyes was among the spectators in the Philippine team's game against Korea. JAKARTA – Gilas Pilipinas coach Chot Reyes felt that the absence of Poy Erram was the difference-maker that led to the Philippines’ loss to Korea in the quarterfinal round. Reyes was happy with how the squad performed despite the loss to Korea in the quarterfinals of the 18th Asian Games, saying that the Philippines was just a few breaks away from winning the ballgame. The biggest break that didn’t go the Philippines’ way, according to Reyes, was the injury of Erram, who suffered two cracked teeth. “I was very, very happy with the effort of the team,” Reyes said. “I thought coach Yeng and his coaching staff put together a really great gameplan. It was a gameplan that would get us a victory in this game. “But a couple of things, couple of breaks. The big break was when Poy Erram went down with the injury. We were up by what six points, in the middle of the third. He had to come out. That unit was playing very well. That kinda changed the system a little bit, the cohesion a little bit,” said Reyes. Reyes also felt the ball also didn’t bounce the Philippines’ way as the scrappy Koreans were able to get extra possessions that led to three-point shots. “They were missing their three-point shots but they were getting offensive rebounds after offensive rebounds. And it ended up with a scramble situation, and that’s when they hit those threes,” Reyes said. Reyes, who arrived here on Sunday, was still impressed with how things went for the Philippines. “I thought the team was very disciplined in set offenses. We didn’t give them many real good looks on three-ppint shots. They got their three-point shots on breakdowns and scramble situations, wala na tayong magagawa doon. I think in my mind, we were one or two plays away from reversing the outcome of the game. “Can’t take anything away from this team, from coach Yeng and the players. They gave it their all through so much difficulty, such great odds, they fought and I feel a lot of pride in really cheering for them. Sayang. We’ve shown that we are competitive against Korea,” said Reyes.